This is a new special tool for all Triumph twin cylinder motorcycles from1945 to 1967*, it is the correct clutch centre extractor for all models from these years which have the CEI thread form, 1968 onward a similar extractor was used but with a UNF thread form. 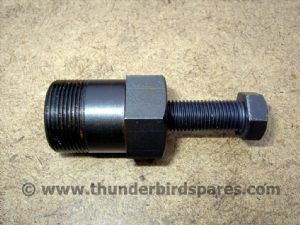 We also sell the UNF type tool please see our other listings. It is essential if you are planning on dismantling and rebuilding the clutch on these models to prevent damage to your components. It also fits and extracts the plain magneto pinion used on pre unit models with a cable operated advance/retard (*but see note below).